Polished Concrete in Atlanta, Georgia. What could be better than ICPSC 2013? For those that were unable to attend, let us give you an insider’s look of the entire trade show. 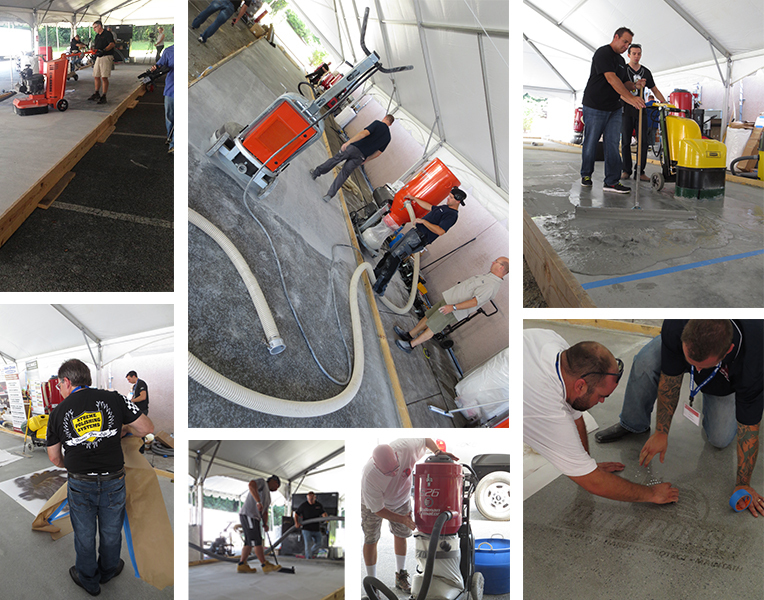 From September 12-15, ICPSC was jam packed with exhibitor booths, concrete slab demonstrations, and seminars lead by industry leaders. 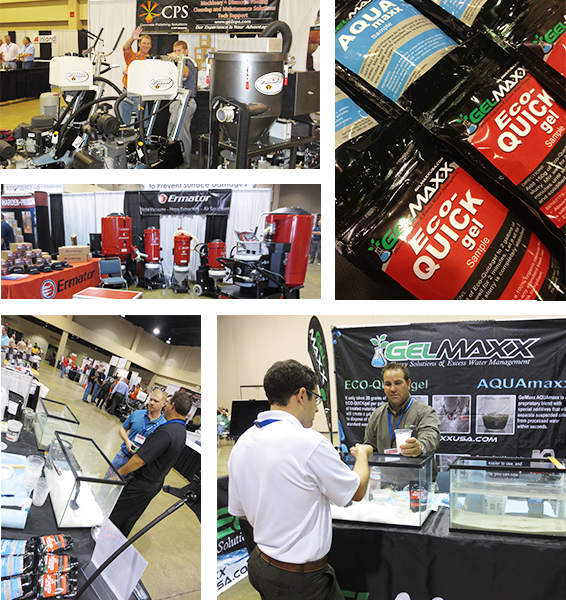 During the two exhibiting days, the show floor was packed with amazing vendors from around the US. To name a few, there was Ermator, Runyon Surface Prep and Rental Supply, Xtreme Polishing Systems, Concrete Polishing Solutions and many more. If you were a contractor that was on the fence about buying certain products, ICPSC was the perfect venue to get a hands-on experience and one-on-one interaction with a knowledgeable sales representative. Although the tradeshow was smaller in comparison to events like World of Concrete, all the major players in the industry made sure to be present. For any attendee, the $40 entrance fee is well worth the price to walk the show because of the quality of venders that were present. The Gelmaxx booth had a constant stream of contractors and manufacturers that were intrigued by our demonstration. Many were still shocked by how fast the separation of the AQUAmaxx separator was and the high absorption rate of the ECO-QUICKgel solidifer. One of the highlights of the show is when we demonstrated how clean the separated slurry water from AQUAmaxx was. It is clean enough for fish to live in! 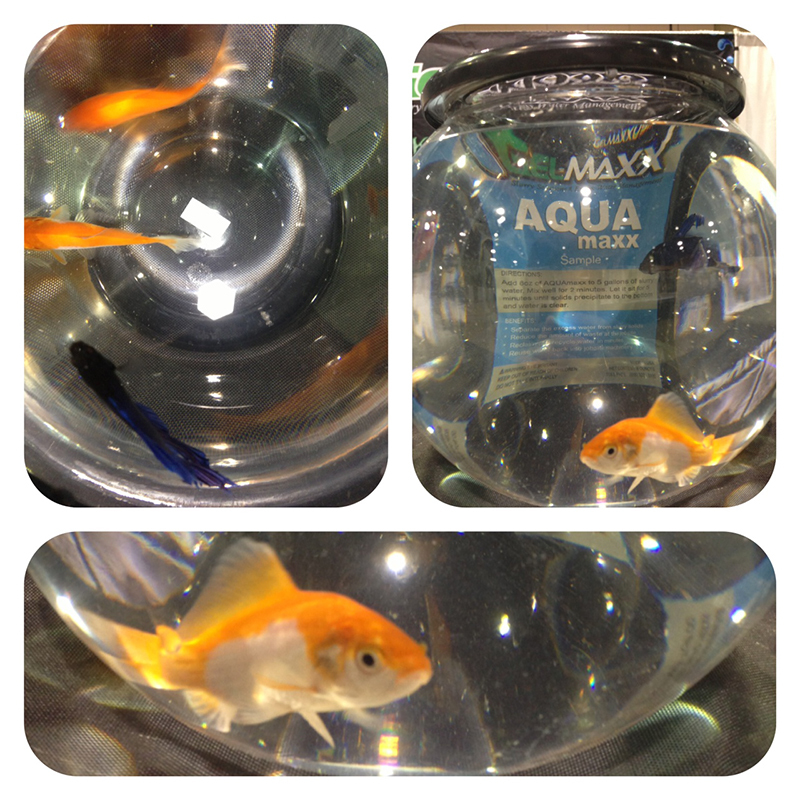 Now if the fish approve, the water is certainly clean enough to reuse in your machines. ICSPC was certainly the place to get all the current news in concrete polishing. The seminars ranged from “Successful Business Strategies” and “Understanding Abrasives” to “Powering Your Worksite” and “Producing Architect Lunch & Learns”. Even Skip Edwards, the founder of Gelmaxx, gave a seminar. Skip teamed up with David Straud from Ermator to give an insightful presentation about Proper Waste Disposal and the Physics of Vacuums. Click HERE to view the PowerPoint slides that went along with their presentation. A video link will be provided in a few short weeks. With OSHA’s new law proposals about silica dust prevention, many contractors attended the seminar with a peaked interest. A change is coming to the concrete industry, and Gelmaxx be the solution you need. ICPSC 2013 was a colossal successful, and we cannot wait until next year’s event.